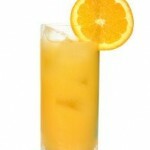 Screwdriver cocktail - ingredients: 50 g of vodka, orange juice. Preparation: put three ice cubes into a glass, add vodka. pour orange juice, stir and serve.